Posting a build guide on my experience with this enclosure before passing it along. Note the 35W TDP bios is required to have stable performance using the 60W standard power brick. After applying either purge-wrangler.sh or the automate-eGPU EFI this setup just works. The eGPU shows up as a "Baffin Prototype" which I guess is either cool or annoying depending on who you are. 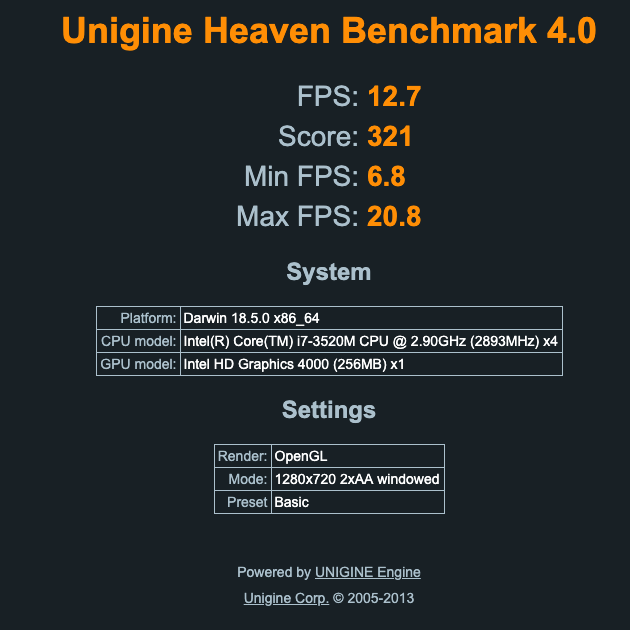 In synthetic Unigine benchmarks, the 35W BIOS only shaves about 2% from the stock BIOS score. I couldn't get around Error 12 using my current Windows installation. The big issue is the fact that I installed Windows in "EFI" mode, which makes my AKiTiO Node setup plug-and-play, but also means that I can't use nando4's DIY eGPU software to get around Error 12. If I were only using the Thunder2 enclosure I would install Windows in "MBR/Legacy" mode (the way Bootcamp Manager normally installs it on these Macs) and then using the DIY eGPU Setup 1.35 software it should work. See TuxThePenguin0's build for more info on this issue. After starting up with the device plugged in, it was immediately recognized by the OS and listed in the output of the command lspci. I had some issues of freezing when trying to use the card's outputs. I think was due to the flashed BIOS as it was working before. My main reason for doing this comparison was to see what the Thunder2 brings to the table in 2019. It was a great intro to eGPU's when it came out, however now there are a lot of better Thunderbolt 3 options, some of which are even as small as the Thunder2. With that said, so long as you ensure compatibility, it's still able to pack a nice graphics or computational boost into a small, aesthetically pleasing, quiet package. So much so, that I actually took the PCB out of my Node and (after a little filing on the top TB2 cutout of the enclosure) put it in instead of the Thunder2 PCB. Powering it with a Dell DA-2 gives the quiet, small enclosure I wanted with the compatibility and power of the Node that I needed. Any pics? Are you saying you put a Node tb3 board into a Thunder 2? Agreed the Thunder 2/3 ‘s are some of the nicest looking enclosures. I just hope Navi brings low power itx cards with some real power. The board size and screw holes are the same so all I did was widen the existing hole on the back to get to the thunderbolt 3 port. Couldn't agree more on Navi I hope we see a big bump in performance at the low-mid range. im a bit over the size of my Razer Core, looking forward to building my own mini. @eightarmedpet The VisionTek/PowerColor Mini eGFX is smaller than the AKiTiO Node Lite/Thunder2/3. It's not a looker but has simple construction so you can build a nicer looking enclosure for it. 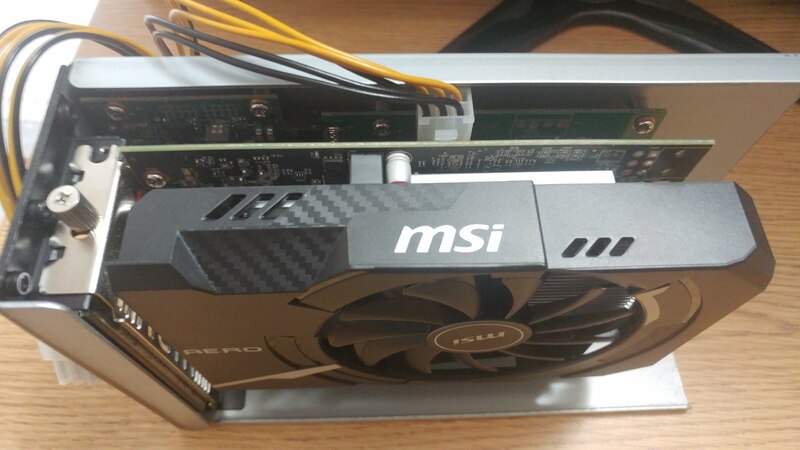 You can also extend the length in the custom enclosure to fit full-length GPU. I personally like open solution to show-case the GPU. Given the entire TB3 mainboard is tiny and sits at the bottom, you have a lot of options to get creative. 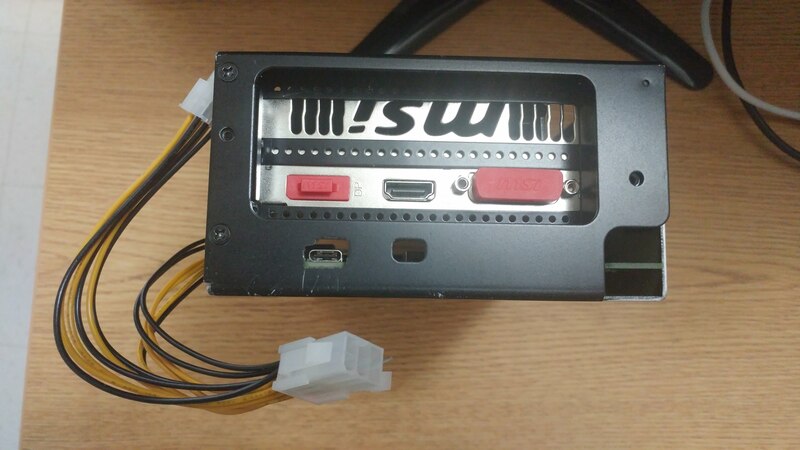 @itsage I’ve been threatening to make my own enclosure for a while and maybe I will one day soon... I’ve just bought the correct PCIe riser thing you used to power a tb3 display so maybe I should build an enclosure that contains both. That Visiontek board would be a great starting point too actually, I could get cable extenders to reroute everything to one end to clean things up. I like the idea of minimal footprint so possibly a vertical design and/or a mini itx card.